FIREX 600 makes warmth even more enjoyable All the pellet stoves have a combustion chamber made from FIREX 600, a vermiculite based material developed by Ecoteck after long and extensive research. FIREX 600 captures the heat generated by the flames, stores it then gradually releases it, improving combustion quality and keeping the firebox free from combustion residues via a process of pyrolysis. FIREX 600 combustion chamber linings give pellet stoves the same heating effect normally associated with natural wood burners. FIREX 600 has been examined by the ‘National Institute of Occupational Health, Denmark (AMI)’, and is certified free from asbestos and quartz fibres. 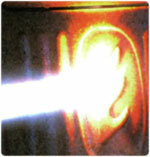 A block of cast iron is subjected to an oxyacetylene flame. 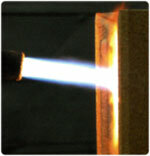 A block of FIREX 600 is subjected to an oxyacetylene flame. 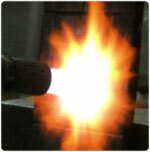 The cast iron starts to melt and drip after 50 seconds. The pyrolytic phase is reached after 50 seconds. 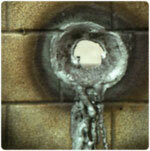 What is left of the cast iron plate after the action of an oxyacetylene flame. 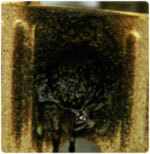 It takes about 5 minutes of exposure to an oxyacetylene flame before the FIREX 600 block even begins to show signs of damage. 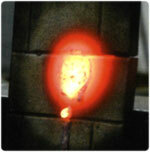 Damage is only visible on the side exposed to the flame, with no sign of overheating on the other side. The block is still whole and perfectly functional.